Dentists in Delray Beach: What Should You Look For? Choosing the right dentist is the key to great oral health. However, making the right decision isn’t easy. There are many dentists to choose from, and some are more qualified than others. If you’re choosing between dentists in Delray Beach, then you need to choose carefully. Here are a few key things that you should look for before choosing your dentist. Many people don’t realize the importance of a dentist’s location and availability. Although you might think you only need to visit your dentist a few times a year, you might need more frequent visits. For example, you might need a dental procedure. That procedure could require several visits over the period of a short time. If you have a long commute, then visiting your dentist could be a chore. Having a local dentist can make your procedure more convenient. There’s also the issue of availability. Some offices offer limited availability. When this happens, you might not be able to schedule an appointment for months. In other cases, you might not be able to get an appointment that fits your schedule. Be sure to check the office hours of your prospective dentist. If the hours are too limited, then look elsewhere. Availability and location matter the most when it comes to dental emergencies. Unfortunately, you never know when a dental emergency can occur. You need to prepare yourself for the possibility of a dental emergency. When one occurs, you need to be able to get to your dentist quickly. An office with good availability and a close location can help you quickly. And the sooner you get help, the better your chance of recovery. Few individuals enjoy going to the dentist. For this reason, it’s important to choose a dentist who makes you feel comfortable. When you find a dentist that puts you at ease, dental work becomes more comfortable. Instead of fearing it, you might only look forward to the outcome. Part of the comfort means that you feel comfortable asking questions. Often, people fear dental procedures because they don’t understand them. If you feel comfortable asking questions, then you might feel better about your procedure. Look for a dentist who welcomes questions and does not speak down to you. When you’re choosing a dentist, be sure to visit several dentists in Delray Beach. This gives you an opportunity to determine your comfort level. Speak to the dentists at the practice. If you feel at ease, then you might have an easy decision to make. However, if you’re not comfortable, then you might want to look elsewhere. Although cost should not be your deciding factor when it comes to dental care, it does matter. When you’re choosing between dentists in Delray Beach, consider several cost-related details. First, you should think about whether or not the dentist accepts your insurance. If you have dental coverage, you should choose a dentist in your network. You can go out-of-network, but you will need to pay for the dental work. If you don’t have dental insurance, then you should look at the payment options for the dental office. For example, they might only accept cash or check. Meanwhile, another dentist might accept a payment plan. Think about your budget and which payment options work for you. There’s also the cost of procedures. Every office has different prices for procedures. Although you might have insurance, your insurance might have a limit. You should consider the cost of procedures at the varying dentists in Delray Beach. For a point of comparison, pick a few common procedures. Then, see how the prices vary among several dentists. One very important detail about a dentist is her personal qualifications. When it comes to dentistry, not all qualifications are the same. For this reason, you should look into your dentist’s qualifications. 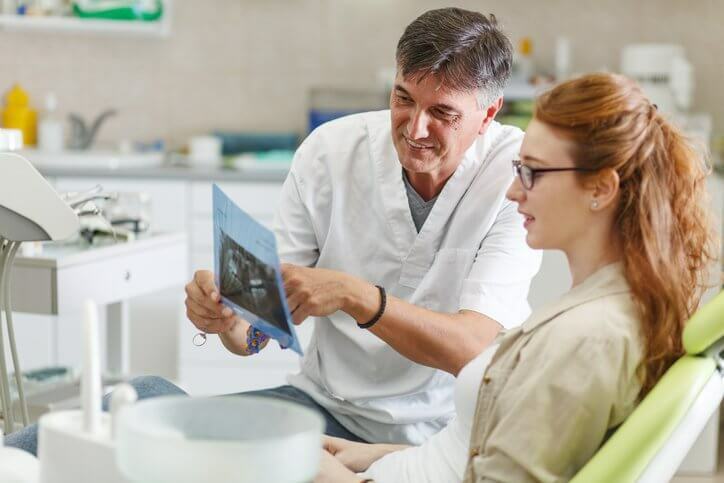 Whether you call the office or visit in-person, the receptionist should be willing to give you the information about a dentist’s qualifications. If she is not willing to do so, then be wary. Although Delray Beach has several dentists, choosing the right one doesn’t need to be a difficult decision. Look for a few of the factors, and you can make the right call. However, you might have a hard time selecting your dentist. If that’s the case, then there are a few easy ways to get started. First, you can ask friends or family for recommendations. If you don’t want to ask them in person, you can ask on social media. In local Facebook groups, people are usually happy to recommend dentists. Be sure to take everything that you read with a grain of salt. However, you can get a general idea of whether or not you should consider a dental practice based on their reviews. Another way to find dentists in Delray Beach is to perform a local search on a search engine. When you find a few local options, you can make a list and start researching them. Check out their websites to find out what services they offer. You can also look for any online reviews on the dental office. Once you find a few options, you can start the selection process. By being thorough, you should be able to select the best option for your needs.